Killer Characters: Ringing in Summer with a Giveaway! Ringing in Summer with a Giveaway! There is much to love in the Berkshires in the summer. Lots of great theater, music at Tanglewood, art at MASS MoCA, festivals. Though there is a river running behind the Cog & Sprocket, I don't go swimming there. Instead, I go out to Caroline's house, and swim at the pond near her house. I spent summers there as a kid, and that watering hole is my happy place. There are a couple of things I don't love, though. One of them is winding clock towers on hot summer days. I'll bet folks never really think about the fact that once a week someone has to wind clocks in towers all over the world, no matter what the season. You'd think winter would be the worst, but it really isn't. First of all, if the tower has a clock that is being tended to, that means the heat is on somewhere. Secondly, once you start winding (350 revolutions usually), you work up some heat. But in the summer? Clock towers aren't generally air conditioned. It gets hot and stuffy, but the work needs to be done. Thankfully, Pat Reed has started experimenting with some tasty summer drinks--shrubs. Fresh fruit marinated in vinegar, then boiled with sugar into a syrup you mix with seltzer water. (Here's a recipe,) Both sweet and tangy. He's working on a strawberry rhubarb shrub. But my favorite so far is his blueberry shrub, with a twist of lemon. Delish, and refreshing! 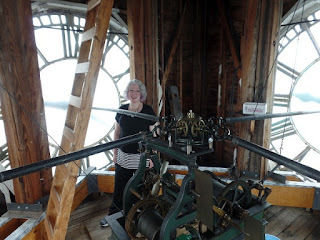 Of course, there's one clock tower I won't minding every week--the clock tower in the old Town Hall. The adventures of getting that built will be detailed in Chime and Punishment this August. Until then, here's a picture of our friend, Julianne Holmes, winding a clock to learn what it is like. In honor of summer reading we’re offering a copy of Clock and Dagger to one lucky commenter. Let me know what your favorite summer drink is. Please include your email in this format: your name (at) your server (dot) com--so the spambots can't pick it up. Giveaway closes at midnight Friday June 23rd. And remember to keep coming back to the Killer Characters blog as there is a new book giveaway every day for the month of June. Talk about refreshing! I like lemonade or perhaps a Sea Breeze. I love to drink peach ice tea. That is my favorite drink. Iced tea has always been my favorite! Ice coffee or ice tea. Sweet iced tea is my favorite but I also enjoy Lemonade. Thanks for your giveaway. Lemonade. I love it mostly in summer, but any time of year, I'll have it from time to time. mcastor07 (at) Gmail (dot) com. Well for more adult beverages I like frozen watermelon margaritas. Mon adult any fruity type ice read. My favorite summer drink is lemonade. This series looks excellent! Thank you so much for the chance to win! Pepsi is my drink of choice - anytime of the year. from the last couple blog entries. I figured they were perpetual clocks. thanks for the chance to get the book. Actually I enjoy beer during the summer. Usually it's whatever the summer run is from Blue Moon Beer. Last year it was a beer with orange in it. My sister just introduced me to her "mocktail." She's down in Tucson AZ and while I was there we would have a Tucson Sunset. OJ, 7up, prickly pear juice, and grenadine. We don't have prickly pear where I live but ours is still good and refreshing! My favorite is either organic skim milk with an ice cube--or a cup of hot green tea. Odd, I know--but it is what I like. lol. Steelers4Sandi (at) yahoo (dot) com. I like a homemade lemonade---none of the stuff from a can or bottle for me. My favorite summer drink is any kind of smoothie! I don't like cold drinks usually but when it's hot out I love fruit smoothies. Thanks for the chance to win too! Iced tea. but without ice. I call it tepid tea. I do love ice cold pineapple juice. Lately, I've been a fan of the Grapefruit Shandy from Leinenkeugel beer. It's amazing and refreshing! Thanks so much for the chance to win! I love lemonade in the summer! I also enjoy many types of unsweetened iced tea (which I drink year round) and limeade! When it's hot I drink diet coke or iced tap water. Love this series! My favorite summer drink is half ice tea and half lemonade. I think that would be lemonade. I love iced coffee on a hot day. My favorite summertime drink is ice cold lemonade. It is so refreshing on a hot day. My favorite summer drink is peach ice tea. Thank you for giving us a chance in this giveaway. My email is spike5271943@aol.com. Good luck to all. My favorite summer drink is peach ice tea. Thank you for this great giveaway. Good luck to all. unsweetened iced black, peach or lemon tea. I guess my favorite drink all year 'round is coffee -- just plain ole hot coffee, no sugar, no cream, nothing. Occasionally I do drink iced tea at mealtime. And I enjoy an occasional glass of white wine before bed. I am fascinated by clock towers. I'd like to see the inside, the workings of the clock, but I'd never be able to make the climb. Iced sweet tea is the only way for me in the summer!! I'm a tea drinker. Love my iced teas in summer. I love iced sweet tea! Thanks for the chance to win a copy of your book, it sounds interesting. Love hot and cold tea. 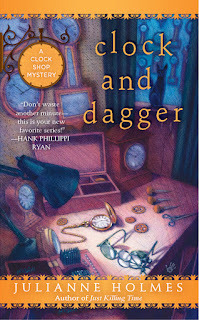 Looks like a great cozy mystery. Comments are closed. Winner has been notified. Remember, giveaways every day!